Today is the 28th edition of our periodic guest post series called 10 Questions. We have a list of 17 questions we pose to fellow financial bloggers, and they are free to pick and choose 10 or answer all of them. Let us know if you would like to be featured in a future edition of 10 Questions. Everyone has two sides to themselves: the side that believes they can do anything and the side that’s full of doubt and worry. We all deserve to feel like we’re enough and we have the courage to make big moves in our lives – sometimes we just need a reminder! And cartoons are a great way to do that. 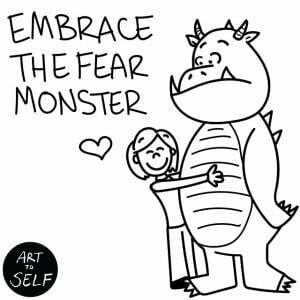 The Fear Monster post was a really important post for me. I was feeling really nervous and scared about launching my book. 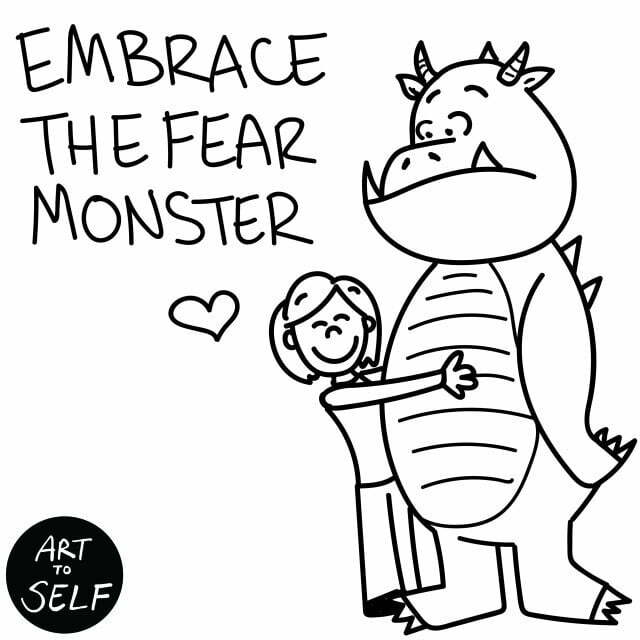 But when I realized that if I embrace the fear, it can tell me a lot. And what it tells me is how important this book feels to me – and that’s a good thing. The response to this was great. And my favorite posts are the ones that other people relate to the most. I feel like I’m already living the life of semi-retirement. I worked really hard in my 9-5 life to pay off debt and build a cushion of savings; now I’m self-employed, drawing cartoons and consulting for a living. I work less, enjoy life more, and never really feel like I “need” a vacation. A pretty good place to be at 28 years old! 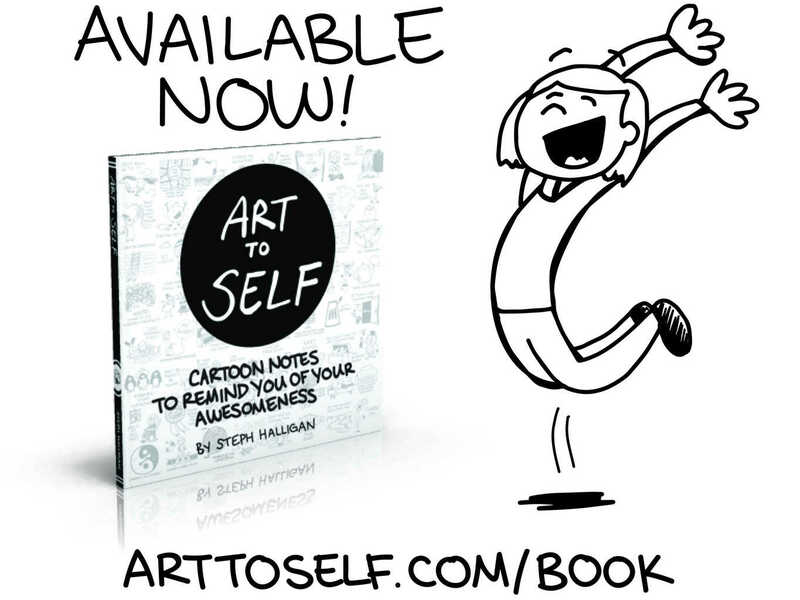 In addition to Art to Self, I do commissioned cartoons and whiteboard animations. I also consult in the financial literacy field. I hope that I could say that I lived a life that was intentional. That I didn’t worry so much. That I enjoyed each precious moment for what it was. And that I’m still figuring out what to do with the billions of dollars I earned as a cartoonist! Honestly, the “note taking” app on my phone has helped me most. Whenever I make a purchase, I log it in my phone with the total and where. I have a flexible monthly amount I’m allowed to spend, and this keeps me accountable if I’m getting close to that limit. There’s always a lesson: spendy people have taught me a lot. I used to be “cheap” and wouldn’t even buy myself things I needed (like a new laptop when mine was barely alive). So I always look at others behaviors as a lesson: what can I learn and how does this help reinforce the values I already have? I am a recovering cheap-a-holic. I definitely get that over-frugality from my parents. But it helped me turn into a very good saver as an adult and really value working for what you want. I wasn’t ever taught it, but it’s so obvious now as an adult what is “naturally” ingrained in me. Kids are observant like that – they soak it all in, even if you don’t teach them directly! Ticket to ride! It’s so strategic and I love that you never know if you’ve won until the very end. Big Magic. Incredible read for any creative type out there. It felt like Liz Gilbert was holding my hand while I was putting the finishing touches on my book. Yoga is my go-to “get out of my head and into my body” exercise. I love a good hike or bike ride. What’s your favorite artist or cartoonist? I grew up loving Calvin and Hobbes, Looney Tunes and the FarSide. 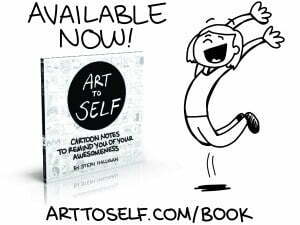 Even as an adult, I can see the influences they have on my work: I’m very philosophical with my cartoons (like Calvin and Hobbes) but I’m always sure to add a little wackiness to them. A huge thanks to Stephanie for answering our questions this week. Keep in touch with her on Twitter, Facebook, Pinterest and over at ArtToSelf.com, where you can sign up for a daily dose of Art to be delivered to your inbox. Great interview! Stephanie is extremely talented and I love her work. I wish I could draw as well as you can. I always enjoy watching those TV commercials and shows that start out with crazy lines and somehow they evolve into a dog or whatever. Nice drawings, Stephanie. I also like, that your postings are a quick read! You have accomplished quite a lot at 28.